Religious art is deeply unfashionable. It refuses irony, the primary tool contemporary art, and it discomfits by challenging the boisterous secularism of much contemporary life. The religious art of the past we can comfortably package – its historical cultural frameworks can be appreciated but do not have to be entered into – but contemporary religious art forces questions about creed and belief we often prefer to avoid. In addition, overtly religious art often lacks the depth in its making or its thinking that would make it persuasive. Bill Viola is in a class of his own. His art tackles broadly religious themes without dogmatism. It is profoundly rooted in the art of the past while determinedly contemporary in its exploitation of digital technologies and use of contemporary costumes and settings. And Viola never shies away from the hard questions. What will people suffer for their faith? What lies beyond death? What is real and what imaginary? It is a tremendous coup for the Auckland Castle Trust to launch its contemporary art programme with this Viola installation in St Peter’s Chapel, a version of Viola’s Martyrs for St Paul’s Cathedral. In the Middle Ages, Auckland Castle was the seat of most powerful political figure in the North of England, next to the king – the only English Prince Bishop of Durham. As every stone of this impressive episcopal palace declares; what London has, Auckland should have too. In addition, Viola’s theme is martyrdom, with the four video panels showing us three men and one woman enduring torment by earth, air, fire and water – a theme in keeping with the Chapel’s dedication, 350 years ago, to St Peter, Martyr, as well as a subject brought home to us continually through contemporary events in the Middle East and beyond. The work is highly formalised – there are no cries, no wounds, no actual immolation – with each figure alone in his or her trial, soundless, resistant to burial, the wind’s battery, to burning and drenching, against a black background. To emphasis the formality, the first martyrdom by burial is run in reverse, the earth seen rising heavenwards. 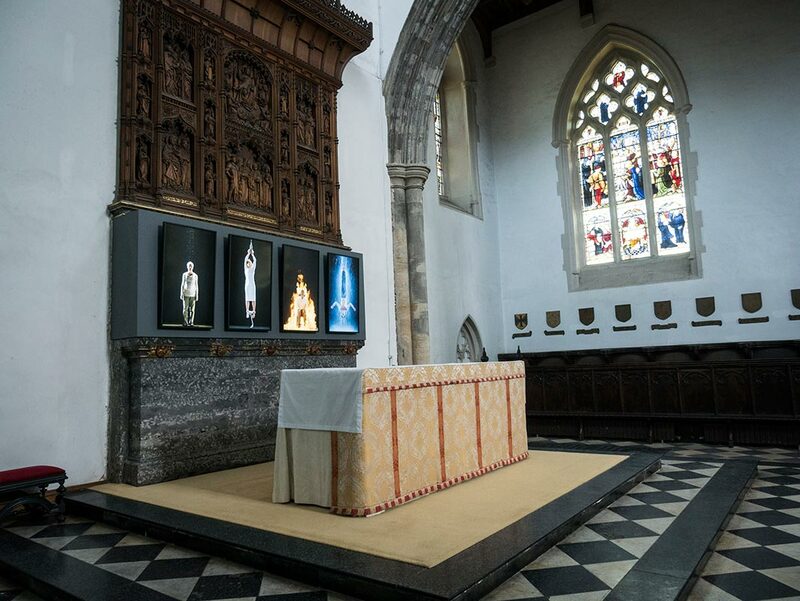 Viola’s team have fitted the installation exactly beneath the Chapel’s huge Flemish reredos, behind the altar, matching the scale of the moving living figures with the carved wooden figures above, stimulating a dialogue between the different art works in this chapel as well as with the audience. Viola’s work fits seamlessly into this ancient edifice (built in the 12th century as the Bishop’s medieval banqueting Hall, it was transformed into a highly decorated, Laudian chapel in 1665 by the devout Bishop John Cosin, and remains in use, the largest private chapel in Europe, to this day.) As such, the exhibition exemplifies the vision of Jonathan Ruffer, the city financier who has acquired the entire Castle Estate and put it in trust for the nation. It is a prelude to the much larger £17m project – which has just won £9m of Heritage Lottery Funding – to create a permanent series of galleries exploring the history and experience of faith in the British Isles. At the core of the project is a two-tier ambition: to restore the castle’s gardens, Deer Park and the state rooms, as redesigned by James Wyatt in the 18th century, and to build a dramatic, two-tier extension above the 16th-century Scotland wing of the palace to house 11 new galleries. Ruffer’s ambitions do not stop there. 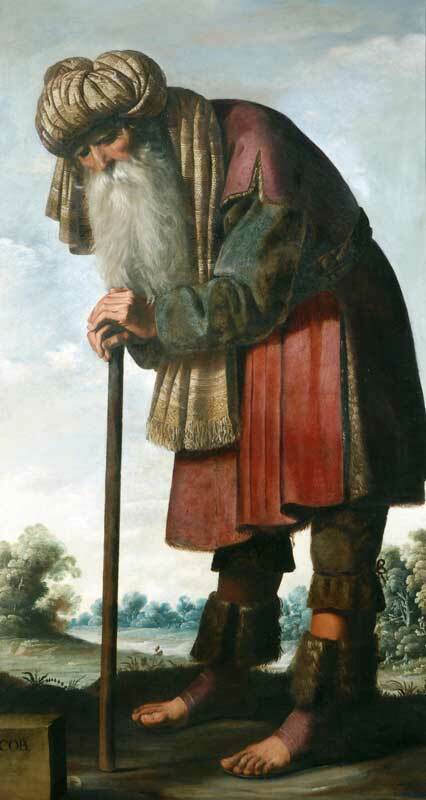 Probably the greatest treasure of Auckland Castle is the series of paintings by Spanish artist Francisco de Zurbarán (1598–1664), depicting Jacob and his 12 sons, representing the 12 tribes of Israel. These were bought in 1756 by the then Bishop of Durham, not just as outstanding works of art, but as a polemical gesture of support for the Jewish people, then struggling to achieve full citizenship in Britain. Ruffer has a great love of painting from the Spanish Golden Age, and intends his rescue of this magnificent cycle to mark the debut of Bishop Auckland as a world centre for its study, with further purchases and loans. As it happens, Auckland Castle, Durham University, the Bowes Museum and Durham Cathedral between them house the biggest pool of Golden Age Spanish art outside London. The Auckland Castle Trust has earmarked a further £4m to convert a former bank building in Bishop Auckland Market Place into a gallery and study centre, with the aim of attracting major loans from private and public collections, including the Prado. While this lies beyond the 2018 opening of the Auckland Castle galleries, it is of one piece with it: a determined effort to link the understanding of great religious art with an appreciation of faith itself. 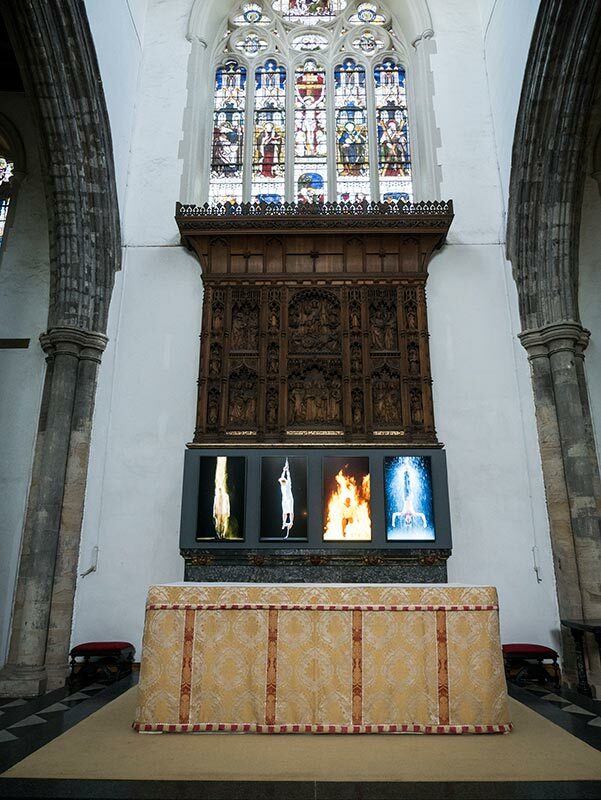 Bill Viola’s Earth Martyr, Air Martyr, Fire Martyr, and Water Martyr (all 2014) are on display at St Peter’s Chapel, Auckland Castle, until 26 October.